In 1914 Jim and Charlie abandon the Australian outback for the excitement and adventure of the war to end all wars. 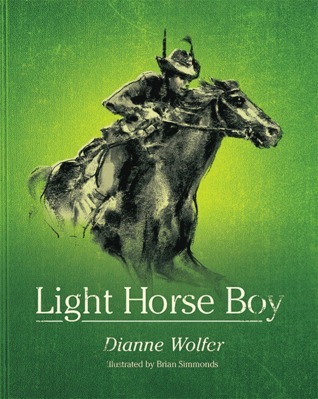 But in the Light Horse they quickly discover the brutal realities of life on the frontline. And nothing will ever be the same again.Featuring stunning charcoal sketches by Brian Simmonds alongside primary source documents and historical photos, Light Horse BoIn 1914 Jim and Charlie abandon the Australian outback for the excitement and adventure of the war to end all wars. But in the Light Horse they quickly discover the brutal realities of life on the frontline. And nothing will ever be the same again.Featuring stunning charcoal sketches by Brian Simmonds alongside primary source documents and historical photos, Light Horse Boy goes behind the scenes of the great ANZAC legends for an intimate look at their experience of World War I.
James and I have read some beautiful picture books about the Light Horses of WWI so we wanted a book that went a bit deeper. This was an excellent read, but I am glad we read it aloud, together. An impeccable mix of fiction, diary, letters, photo, illustration that brings to life all the different facets of war the friendships, the horrors, the contradictions and questions, the bravery and the adventure. With Anzac Day almost upon us, this is one book that should be on everyone's to be read list. Needed to give this five stars. The book takes you on such a journey of preparing for war and then through several WWI battles. The old photos give you even more of a sense of the horror. Horses are such incredible animals. A beautifully presented book and a perfect partner in reading time to Thomas Keneally's Daughters from mars. Thank you Dianne it was a pleasure to meet you and keep wiring. And so on to Lighthouse Girl. This was a great historical read. I loved the illustrations and the use of archival photographs. Suitable for 10 year olds and up. It was really quite interesting. An absolutely beautiful book, capturing the spirit and heartbreak of war. So very pleased I purchased this for our school library, I will be thoroughly recommending it! This book is just amazing. It is a very detailed history of the Australian Anzacs From the troopships to alexander to Anzac cove this book is definitely worth five stars.